We all love socks. That warm, fuzzy knit material is always there to keep our feet cozy and protected. They're even super good for dusting our floors with if we slide around the room enough. If only we could just wear one big sock for our whole body. You know what else is really fun and cuddly? Monkeys. Those little guys are always just swinging around with their goofy arms and long tail being completely adorable. All they ask for in return is a few bananas to munch on here and there. Most of them seem like they'd be absolutely fantastic cuddlers. When they're not running around like maniacs, they're usually fast asleep all snuggled up with the rest of their family. It seemed only natural that the comfort of socks joined forces with the cuddly and cut nature of those fruit-loving fuzzy primates. Thus the most cozy invention since the heated steering wheels was born! The sock monkey has graced the homes of most every household, whether it was handmade or store bought since 1870, and have never gone out of style! In fact, we're putting them even more into style! 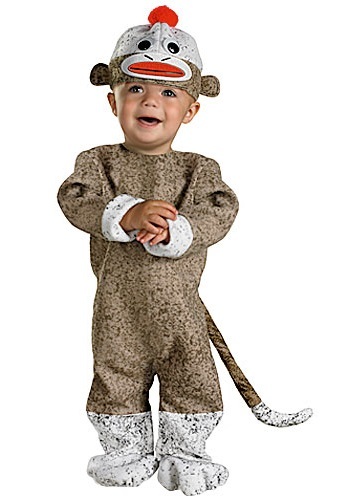 Just check out this super comfy looking Sock Monkey Infant Costume. It's made of knit flannel fabric so it's soft and warm for your own little bundle of joy during those chilly fall months when costume parties are all over the place! Just be sure to pack your bag with a few bananas, because this growing guy is always hungry for more!